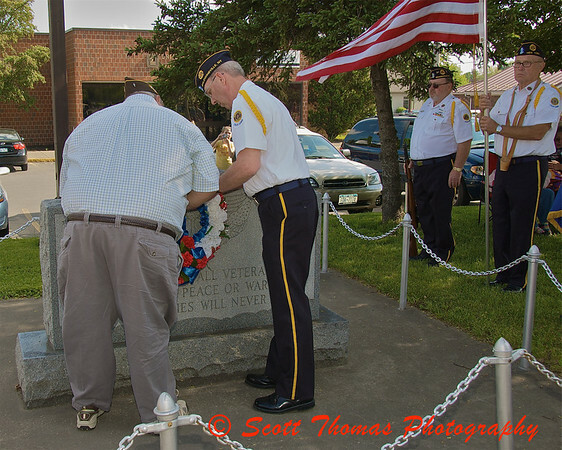 Honoring those who gave their life for our freedom by placing a wreath at the Veteran’s Monument before the start of the Baldwinsville (New York) Memorial Day Parade on Saturday, May 30, 2009. The Village of Baldwinsville for years have hosted their Memorial Day Parade on the traditional date of May 30th. It makes for a great parade as other towns and cities nearby have theirs on the official Monday holiday. One of the traditions is the placing of a wreath on the Veteran’s Monument in front of the US Post Office at the head of the parade route. Other traditions both past and present were detailed in a recent article. Click here to read it. For more photos of the Memorial Day Parade, see my flickr photostream (links to the left). This entry was posted in News, Travel, Weekly View and tagged baldwinsville, memorial day, new york, parade, Photography, united states, veterans, wreath. Bookmark the permalink. I am strongly in favor of the traditional Memorial Day. Also the Monday holidy–dunno why we shouldn’t have both. But they’re different, aren’t they.